The Poulan Pro PP5020AV 20-inch 50cc 2 stroke gas powered chain saw is a surprisingly powerful machine, considering the market it targets and the price point. In other words, the Poulan Pro PP5020AV is a novice-targeted chainsaw that can take many professional lumberjacks by surprise. 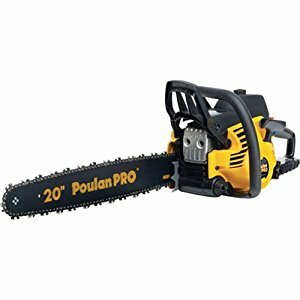 What Makes the Poulan Pro The best Chainsaw? Weighing in at 10 pounds, the Poulan Pro PP5020AV offers the best and latest features at a competitive price. Aimed at users who do not use chainsaw for professional use, the Poulan Pro PP5020AV is equipped with a pull start procedure and decreased apparatus handle that ensures lessened operator fatigue. Some of the other salient features of this chainsaw are the spring and purge assist, 50cc DuraLife engine, SuperClean air filtering system, ability to access the spark plug and air filter sans tools, automatic chain oiler, etc. Of all the consumer chainsaws on the market, the Poulan Pro PP5020AV packs in the maximum power (50cc). And the power comes in at a competitive price. Most other similar chainsaws don’t pack in so much engine displacement and cost at least 100 dollars more. The Poulan Pro PP5020AV is ideal for beginners who are not too sure about spending a lot on chainsaws, but at the same time do not want a major dip in performance. The chainsaw consumes bar oil optimally, ensuring the bar and chain do not overheat when it’s at full throttle. Upon arrival, the saw comes completely assembled, along with the mixing oil. If you’re a newbie who hasn’t used a chainsaw before or if reading the instruction manual doesn’t seem encouraging to you, the ability to use the chainsaw right out of the box should be quite inviting. The Poulan Pro PP5020AV certainly won’t be your go-to tool if you make money cutting and trimming trees. You’ll have to look for the “pro” models that cost significantly higher. The saw isn’t right for larger trees or diameter stumps. Though you may certainly get through the wood, it may not be extremely smooth and convenient. The chain that comes with the saw isn’t the best, but it still does the job. If you can, get the chain replaced and you’ll see a marked difference in functionality. Do not use the saw as soon as you power it on. Idle the saw for some time and let it warm up a bit. This warming up is essential if you want to push the saw to its limit and derive maximum power. Not doing so could harm the bar and chain. As aforementioned, the Poulan Pro PP5020AV is a fairly potent chainsaw that’s both reliable and versatile. You can certainly expect this chainsaw to carry out a range of cutting and trimming tasks. However, don’t expect it to perform heavy-duty tasks, especially frequently. If you do not use this chainsaw too hard, the Poulan Pro PP5020AV would come along fine for quite a few years. Though not the best or the most powerful chainsaw ever made, the Poulan Pro PP5020AV is certainly the best chainsaw for the money.